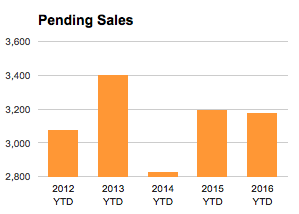 Pending home sales in St Louis fell slightly last month from a year ago for the 5-county core St Louis market (city of St Louis and counties of St Louis, St Charles, Jefferson and Franklin). Through the end of last month, there were 3,182 pending home sales for the area, down slightly from 3,200 during the same period a year ago. 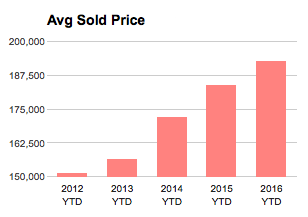 As the chart beneath the pending home sales chart illustrates, the average list price of homes for sale in the 5-county core St Louis market during January are up significantly from the same time last year. 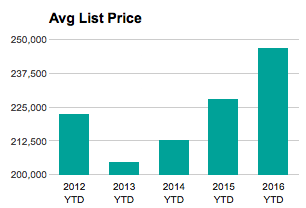 Year to date through last month, the average list price was $247,076, an increase of 8.3 percent from a year ago when the average list price was $228,136. Homes sold in St Louis in January sold for an average of $192,880, an increase of 4.9% from a year ago when the average sold price was $183,898.